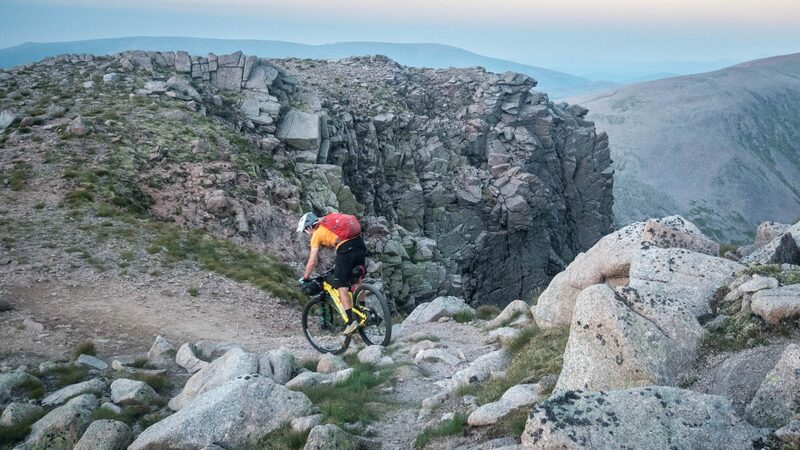 The granite plateaus of the cairngorms began their life far from the sun, at the roots of a mountain chain, at a time when Scotland and America were still parts of the same landmass. Wind, water and ice took their toll, and the mountains were eroded into nothing, but their roots remained. Ice came and took bites from it, but the granite was only diminished a little, 1000m above the land around it. It became Am Monadh Ruadh, the Cairngorms: round-backed and standing proud of everything around them, a mountain fiefdom separate from the rest of the Highlands. They are closest thing to wildness that we have on our increasingly crowded island. Winters are long for the Cairngorms: the mild, damp Atlantic climate of the glens is replaced with sub-arctic patterns of early frost and late-lying snow, and the wind has nothing to impede it as it tears across their shoulders. Only crawling alpine plants can tolerate it, so that the crowberry beside your ankle is a giant compared to its neighbours. The ptarmigan and mountain hare change their coat to white to meet the onset of winter, and the UK’s only herd of reindeer spend their summer roaming the plateau. Summer is short, but sweet. That’s when the sun never seems to want to leave the summits, and maps come out, and adventures are hatched. 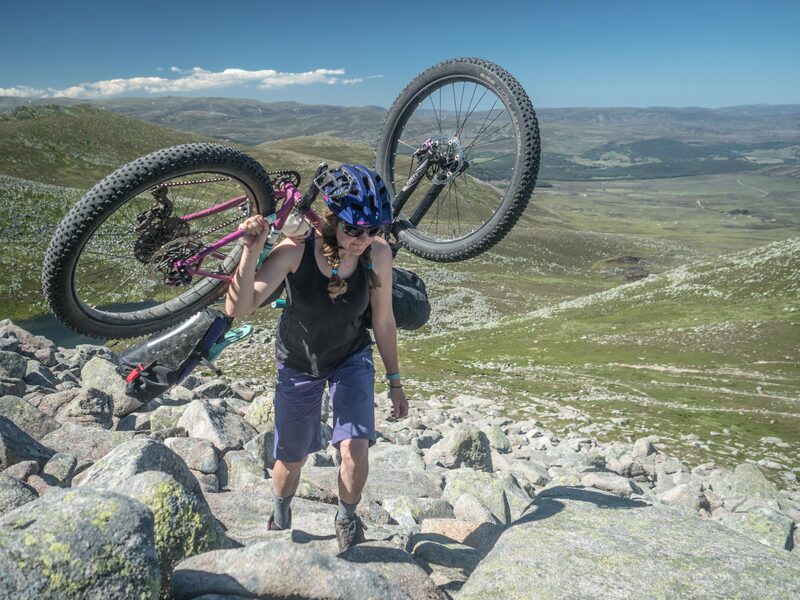 The highest places in the Cairngorms are fragile, and we have to try to tread lightly there whether it’s with tires or boots, but to ride there on a long summer evening is like nothing else. For a few years, we had a route simmering away to try and link as much of the highest places as we could, but aligning the time, the company and most importantly the weather is never easy on an island stuck part way into the North Atlantic. 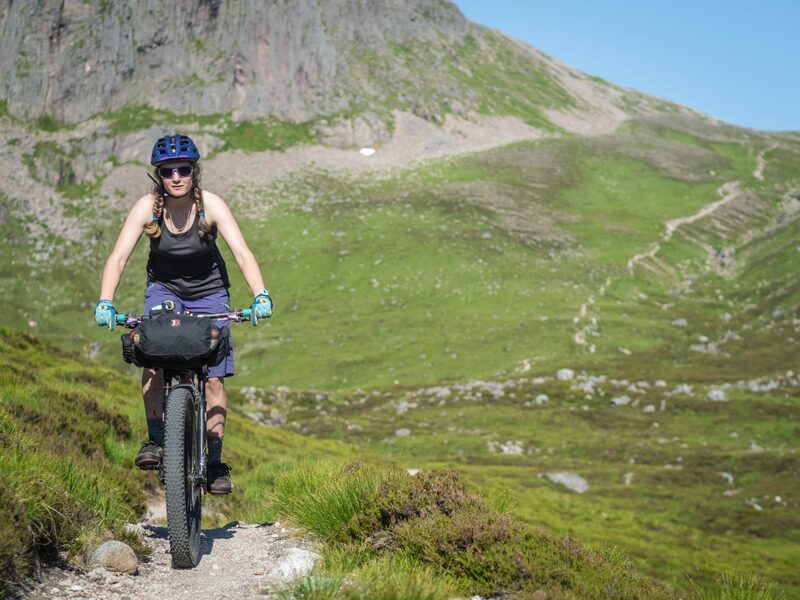 The push towards lighter, more technical routes has given fresh momentum to the inherent adventure of bikepacking, and we knew that a single-track heavy, aesthetic line existed through the Cairngorms, where the easier gradients make the riding efficient enough to be worthwhile. Cue the summer to end all summers! It hadn’t rained for weeks when we set out on a scorching (well, for Scotland) Friday afternoon; the grasses of the plateau were ripening to a midsummer gold, and we were grateful to the ever-strengthening breeze as we winched, sweating up the steep dirt road through the ski centre of the Northern Corries. 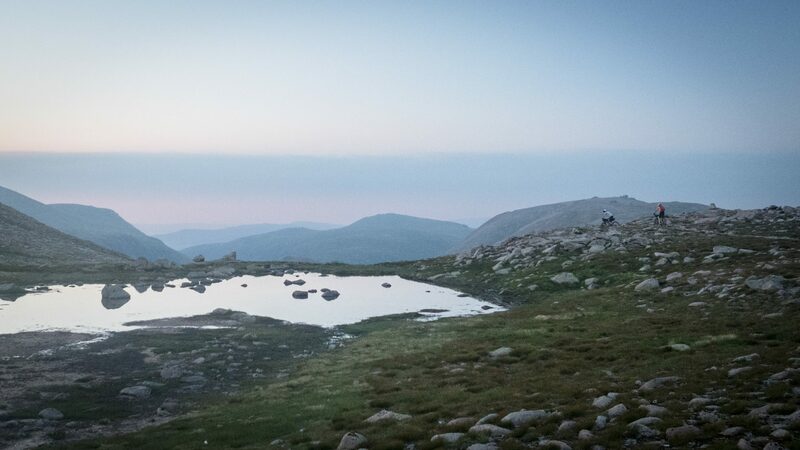 Annie had left a couple of hours earlier, having agreed a rendezvous on the summit of Ben MacDui, the country’s second-highest point. 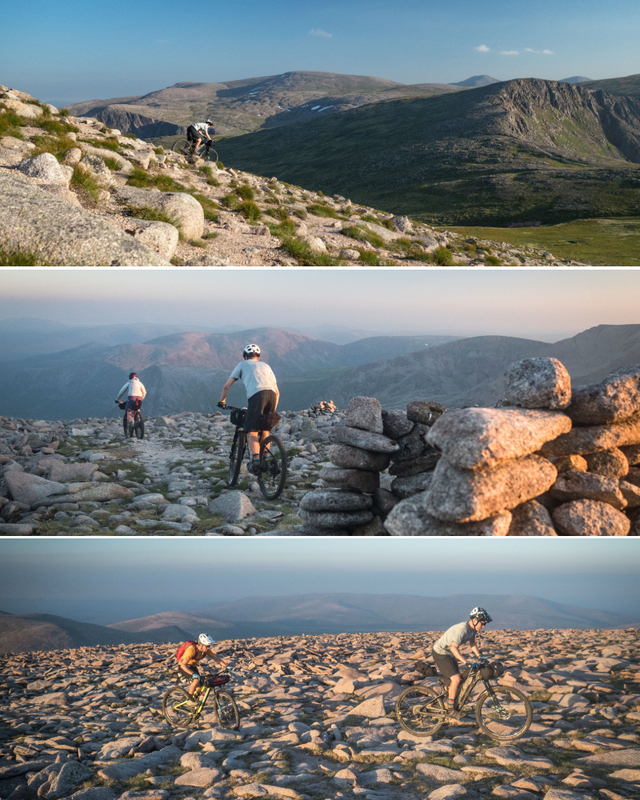 As Scott and I left the mountain’s developed northern face behind from the summit, the empty upland backcountry of the Cairngorm plateau spread its arms wide: the country hidden behind the mountains. From the giant, rounded cobbles of the summits, the trail sweeps the corrie rim in an arc, drawing you on to lochains fringed by yellow-green meadows, before the ground rises incrementally, growing almost too high for even the plants, to the bald, grey head of Ben MacDui, where Annie stood waiting. It was 10.30pm. To watch the sun set from a mountain’s top is a rare treat, no matter where or what you’re doing. Nan Shepherd wrote some of the most famous words about these mountains, saying: “The focal point is everywhere. Nothing has reference to me, the looker. This is how the Earth must see itself.” An hour of descending later, we camped beside the dark waters of Loch Etchachan, still high enough to watch the fading glow as the sun hid itself for a few hours. One plateau down. 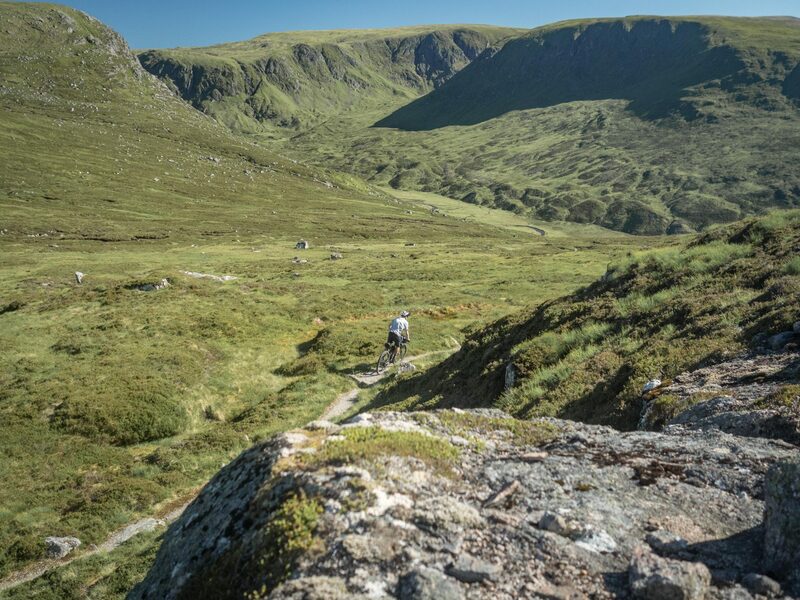 When we next opened our eyes the light was clear and bright, the temperature rising as we continued to descend into Royal Deeside, stopping for breakfast in Braemar after stopping for a mandatory swim in the Derry Burn. The day ahead took us towards Balmoral Castle (no, the Queen wasn’t in) and ‘Dark Lochnagar’, who looms above it. Even loaded with plenty of food, it’s a joy to travel light in the summer months. I’ve been using the Vole seat bag for a wee while now, but this was the first time I’d used it with a dropper post and in honesty I’d forgotten it was there on the technical descents of the day before. Between the Vole, a small Sweet Roll and a small rucksack, I had everything I needed. Not that packing light made the climb on to our second plateau any easier. More winch, more sweat, more opportunity to eat some food and lower that weight… Like Cairn Gorm, Lochnagar’s dour northern face masks the plateau behind, and after a lengthy hike the climbing was done. On the way, a hiker kindly told Annie, a little ahead of Scott and I, that it would be impossible to get a bike there. The fact that she had, in fact, done it before didn’t change his mind. 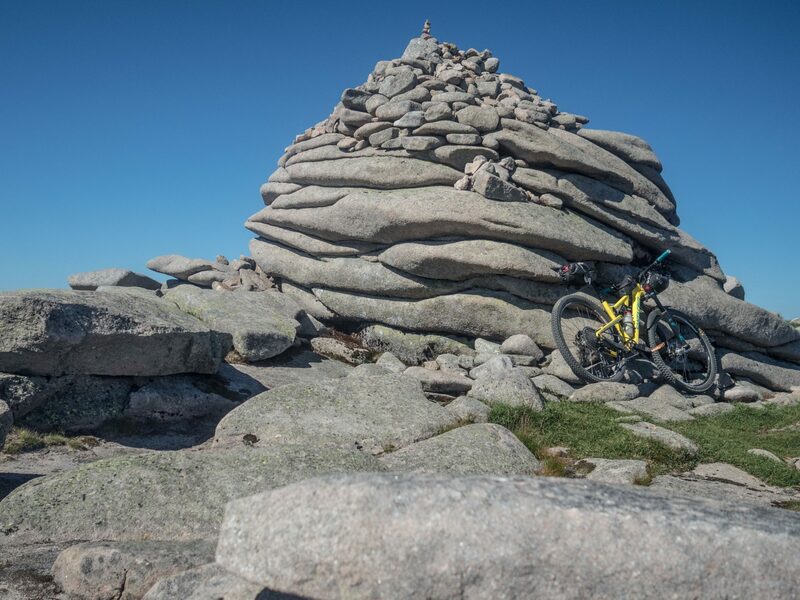 The tors that pepper the plateaus of the Cairngorms are relics of the landscape before it was scoured by ice, being preserved in the highest places because the ice was moving away from them rather than over them. They are remnants of the rock that formed in the roots of those ancient hills, now revealed to the sun. The summit of Lochnagar is a spectacular place, more of a promontory from which we could see our starting place on Cairn Gorm, the royal castle below us, and our third plateau stretching away beyond it to the north. This time, the descent was sinuous, a looping thread of dust between the grass of the meadows that ducked and dived around corners out of sight. The filter of fatigue made it less enjoyable than it could have been, as tired brains stopped sending important to signals to even tired-er-er muscles. There was a grateful sigh as we were spat out not far from Braemar, and a pressing date with the fish and chip shop. From quiet places to quieter still. 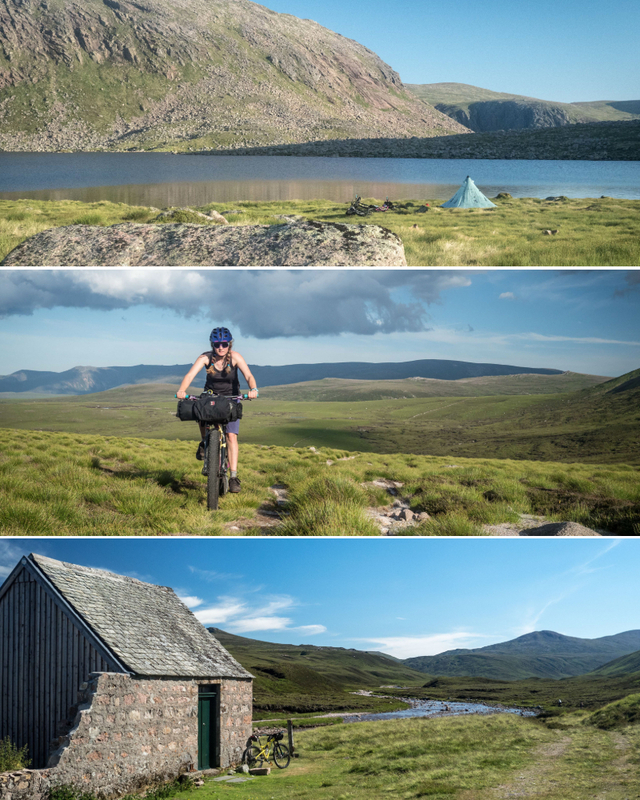 The third and final day would take us to the eastern Cairngorms, the enormous bulk of Beinn a’Bhuird and Beinn Avon, standing silent and more distant than the others. The climb to reach them is, literally, a ladder to the sky, streaking on and on and on around the flank of the hill, to a skyline that never seems to grow closer, until suddenly it is beneath you, and the great stone legs of the northern face are revealed. Summer can’t last, and nor could our time riding up there. Eventually, we dropped out of the sun and back to earth, still with miles to do, but grinning from ear to ear with the satisfaction of having made a familiar part of Scotland feel new again. Summer on the mountains here is all too fleeting, but then again, if adventures like that were possible at any time, they wouldn’t be so special. Soon summer will be dead; long live next summer! Words and photos by Huw Oliver. 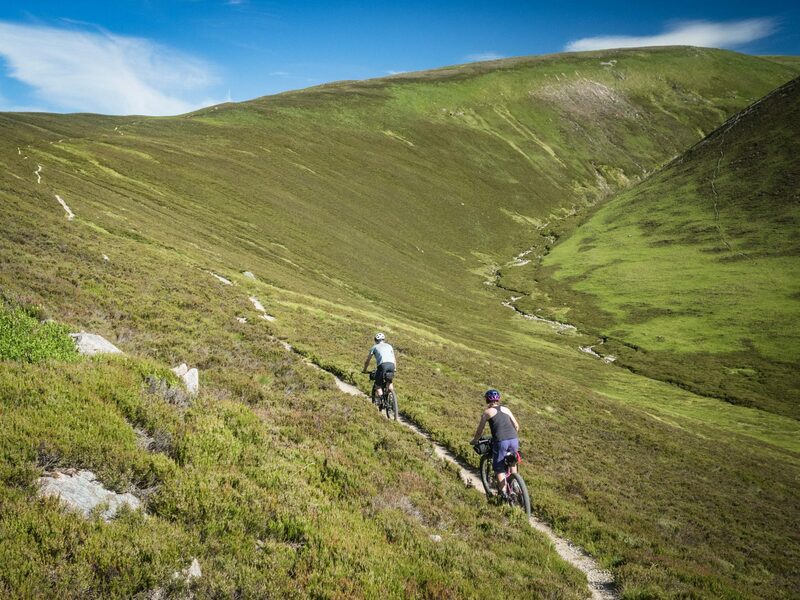 You can follow Huw on more adventures through Scotland and beyond at his blog Topofests. Huw’s favorite thing to read is a map – when he moved across the border to Scotland, the first thing he did was buy one. 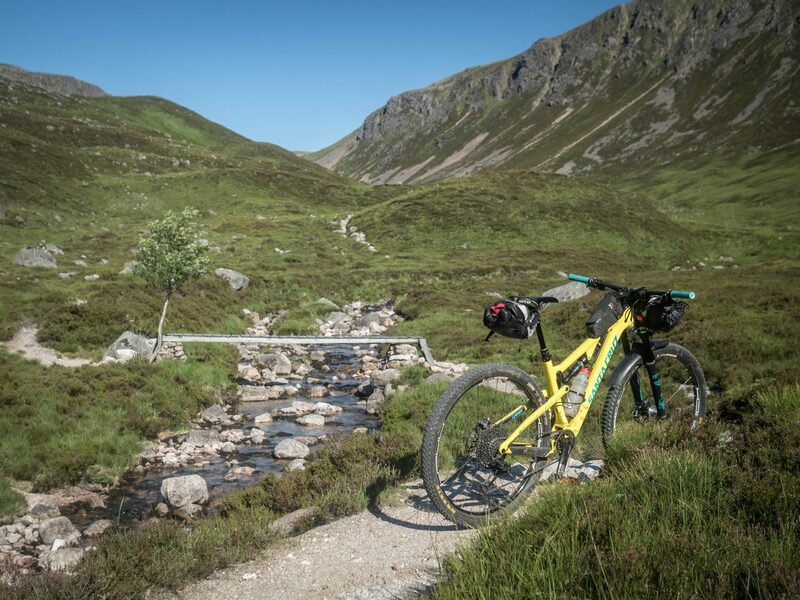 Bikes are a good way to check that the map wasn’t lying, and the resulting trips have taken him to nearly every bog in Scotland, to Patagonia, Nepal and Arctic Lapland. 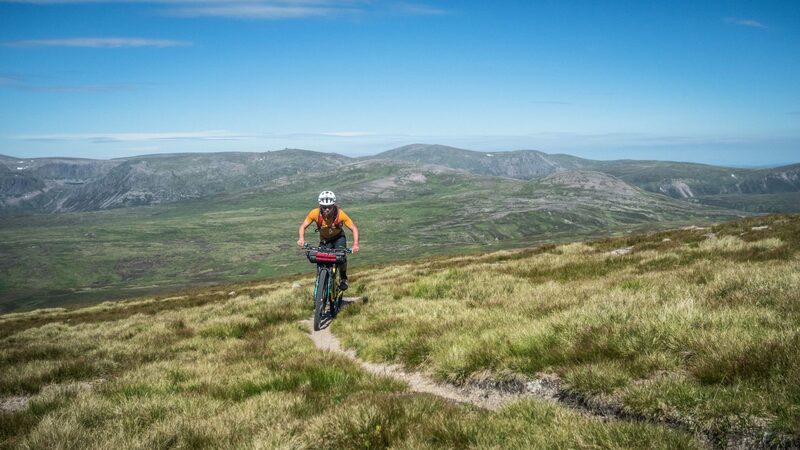 The odd bikepacking race thrown in for good measure keeps him honest. More recently, the addition of a packraft meant that even the blue bits of the map are fair game! 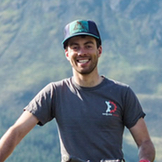 Occasionally, he works as an outdoor educator and mountain bike coach, hoping to show other people why they ought to read more maps, too. His blog is Topofests.com.